Carry your essentials for a casual day at work or a day trip around town in this stylish nylon Cheetah print tote bag from baggallini. The baggallini Santiago Tote bag is made from water resistant crinkle nylon fabric and features a large main compartment with a top zipper closure and a contrast color interior lining. 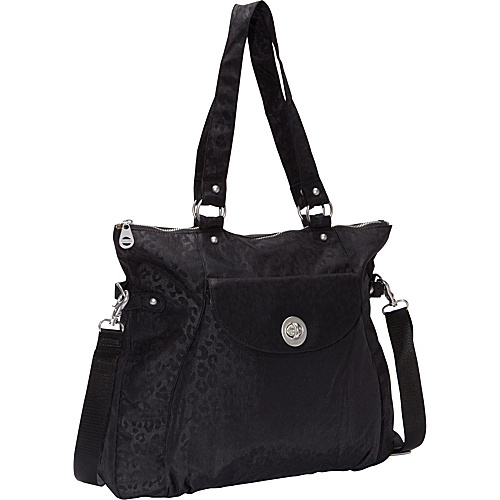 This tote bag includes a padded interior pocket to hold your iPad or tablet, a removable coin purse, and organizer pockets to hold your cell phone and other small items. An exterior flap pocket with a zipper and turn lock closure offers added storage for frequently used accessories. Available in Black, Brown and Orange Cheetah.